Multiple cross-site request forgery (CSRF) vulnerabilities in the AB Google Map Travel (AB-MAP) plugin before 4.0 for WordPress allow remote attackers to hijack the authentication of administrators for requests that conduct cross-site scripting (XSS) attacks via the (1) lat (Latitude), (2) long (Longitude), (3) map_width, (4) map_height, or (5) zoom (Map Zoom) parameter in the ab_map_options page to wp-admin/admin.php. This plugin is vulnerable to a combination of CSRF/XSS attack meaning that if an admin user can be tricked to visit a crafted URL created by attacker (via spear phishing/social engineering), the attacker can insert arbitrary script into admin page. Once exploited, admin?s browser can be made to do almost anything the admin user could typically do by hijacking admin's cookies etc. 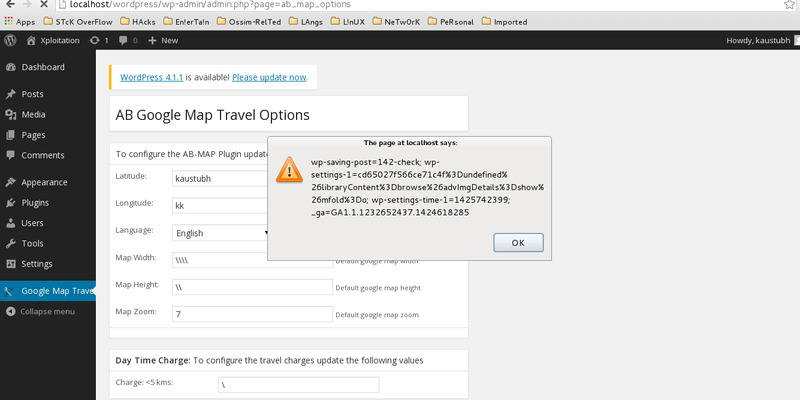 Visit Google Map Travel settings page of this plugin anytime later and you can see the script executing as it is stored.